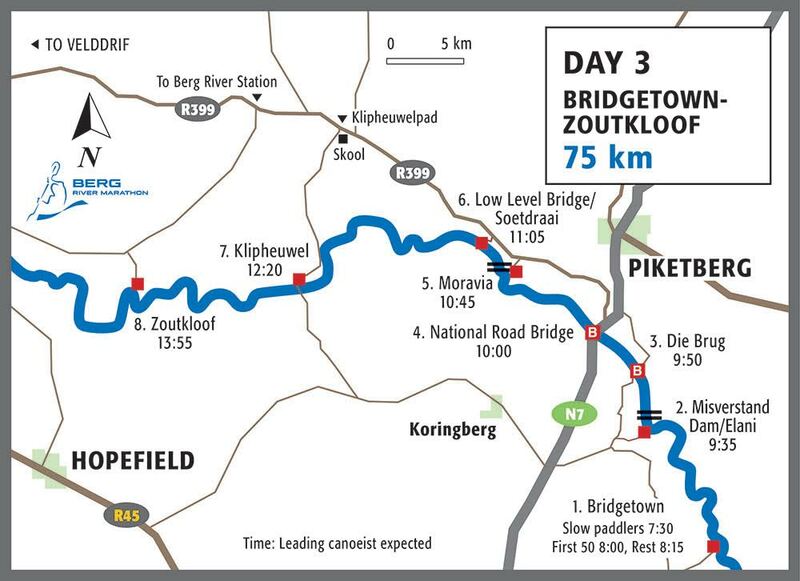 From Bridgetown take the tar road back to the Gouda/Moorreesberg road and turn right onto the N7 for ±10km until you reach the sign to Misverstand Dam. From Misverstand Dam follow the dirt road back to the T-junction on the hill and turn right towards the “Die Brug” iron bridge. Parking is not allowed on the new N7 bridge. Rather turn off the N7 onto the service road, which will take you to the old bridge where you will also find a gathering of school children which is part of our Bridge Festival program. When you leave the National Road bridge turn back towards Piketberg and turn left on the R399 towards Velddrif (this is a tar road). Turn left at Moravia where you can see the paddlers shooting a weir underneath a low-level bridge. Follow the road back to the R399 and turn left towards Velddrif. Drive for about 4km and you will see the river and low-level bridge from the hill. Drive down and walk the last 100 meters. Follow the signs from the main road. This is also cut-off point for late paddlers. Turn left off the R399 at Bergrivier Plase sign onto a dirt road to Berg River Station and Kersefontein. This road is slippery when wet.